Placing a terrarium on a table, shelf or countertop is a simple way to bring greenery indoors. Stylish, easy to move and creative, a terrarium keeps springtime alive in the home no matter the season outdoors. While picture frames are often best for displaying well-loved photos, they are also an ideal base for creating a DIY terrarium that works in a home or office. Five frames are all it takes to make the transformation complete. 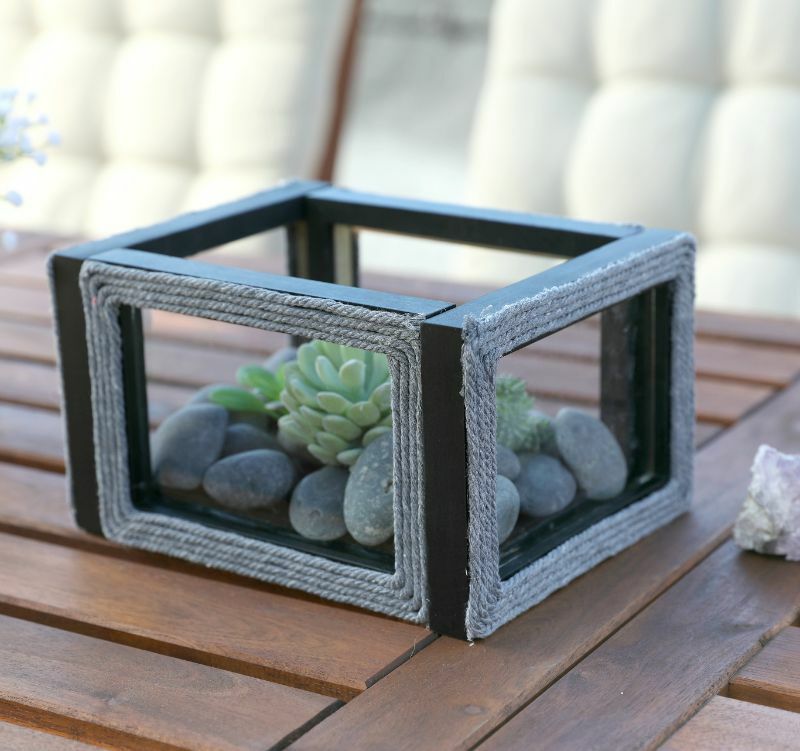 Adding gray yarn to the outside of the frames gives the terrarium an elegant look that works well in a variety of home décor designs. A handful of rocks from right outside the front door is enough to give the terrarium's interior a natural look. Add a few final succulent plants to provide a vibrant pop of color. Feel free to mix and match interior plants or exterior yarn colors for a terrarium that’s customized to your taste and style. 1. Remove the backing and glass from a picture frame and place it horizontally on a flat surface, facing up. 2. Apply hot glue to the long, top edge of the frame. 3. Press a string of gray yarn to the hot glue to attach. Continue lining the perimeter of the frame with hot glue and yarn until the ends meet. 4. Loop the yarn four times around the face of the frame so it's entirely covered with yarn. 5. Cut excess yarn away once all four loops are securely attached. 6. Turn the frame upside down and line the interior edge with hot glue. 7. Press the glass back into the frame using the hot glue to secure the panel. 8. Repeat this process with three additional frames so there is a complete set of four frames lined in yarn. 9. Place a fifth frame without its backing, but with the glass still intact, glass-side down on a flat surface. This will be the base frame. Make sure the frame is lying horizontally. 10. Apply hot glue to the center of the long edge of a frame that’s been lined with yarn. Make sure the yarn is facing out. Press the short edge of the base frame to the glue to attach. 11. Line up the long edges of two more yarn-covered frames with the long sides of the base frame. Make sure the short edges are in line with the standing frame as well. 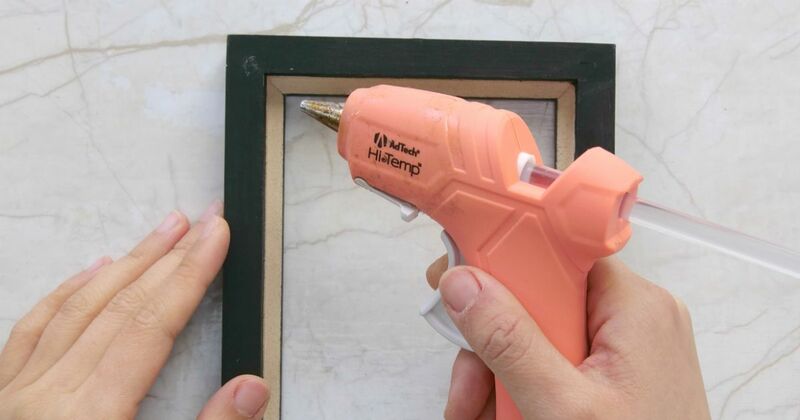 Apply hot glue on all surfaces that touch to secure the frames together. 12. Attach the last frame to the open end of the frame box, which is now a terrarium. 13. Fill the terrarium with 22 rocks. 14. Add three succulent plants to your terrarium and display on a table, shelf or countertop to admire. Share this elegant and original craft on Facebook.